Creativity is a child’s bread and butter, so why not use that to your advantage to teach them about saving money? These clever tips are ideal for teaching your child how to make smart money decisions. Children tend to be visual learners. 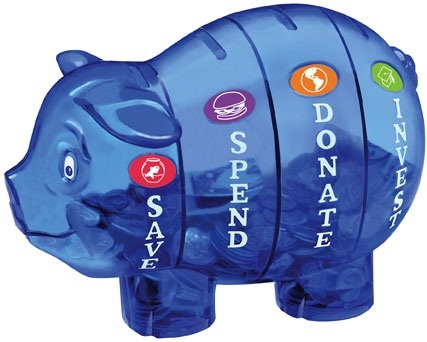 Hang up a savings goal chart, like an empty thermometer or table, that they can fill in as they reach their goal. For older children, have them create a ‘Wish List’ of items they want with the cost included. These visual reminders will help encourage them to save their money instead of spending it immediately. Every child loves a good field trip. Tell them you are going to take them on a field trip to the bank and watch their eyes light up. Many banks offer a joint savings account option that the parent and child can open together. Let them come with you when you open this so they can be involved in every aspect of their money management. Have them deposit money with you on a regular basis, particularly when they receive money for birthdays or holidays. Compare prices in stores or online to help teach your child to spot a great deal. When shopping with your child, check the sale and clearance sections first. Let them know they may find something on their wish list or a similar alternative for a better, less expensive price. Spending Mom and Dad’s money is easy! Help them to develop a better relationship with money by having them use their own money to pay for the items they want. They’ll appreciate the hard work that goes into saving your own money. Teach them the value of hard work by working out a reasonable rate for chores or other odd jobs around the house. Using these rates, share with them how many working hours it would take in order to afford the items on their wish list. Play a board game customized for teaching children about money or make up your own game! For a list of recommended games, check out this article from About.com. You can also visit the TD Bank WOW! Zone game room for interactive computer games for your child. Make a deal with your child that you will match a percentage of the amount they save if the save consistently or reach a certain amount. This could be anything from a video game to their first car—it’s whatever works best for your family! In lieu of a percentage, reward your child for great savings habits. Some experts say it is most effective to reward children with something non-material like an extra hour of TV-watching, a later curfew one night or a sleepover!